Lauren, an art director, and Lino, a senior sales rep, met on a Thursday night at a dive bar in the North End. It was Lauren’s best friend’s going away party. Lino was a friend of a friend that tagged along. Lauren later said, “who knew, as my best friend moved thousands of miles away that this tall, dark, handsome & bearded stud muffin would eventually move in”. Their color scheme was perfect for an August night at the Seaport. They chose the contrast of nudes/blushes with midnight blue. 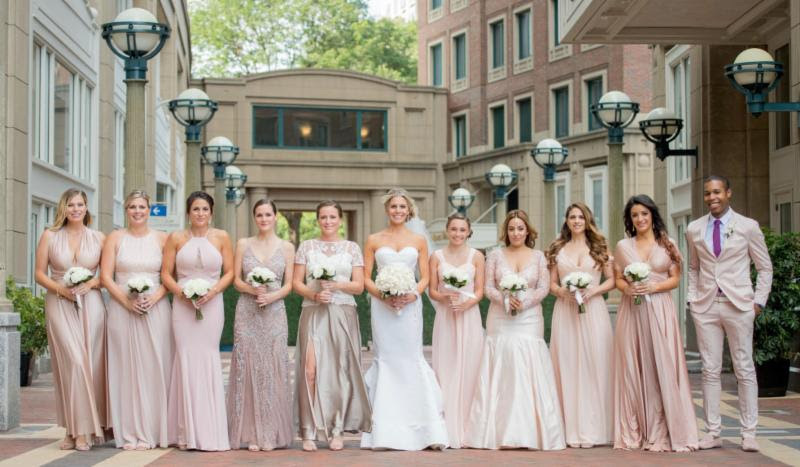 Staying within the color scheme, the bridesmaids (& brides man) picked out their own dresses (and suit) which added a layer of textures and personality to the mix. Lauren, designed their invitations, website, menus, table cards and more. It was a great personal project that she tailored for themselves (with unlimited editing!). They created a fun guestbook with old photos and random questions for guests to answer which turned out to be a really funny read.